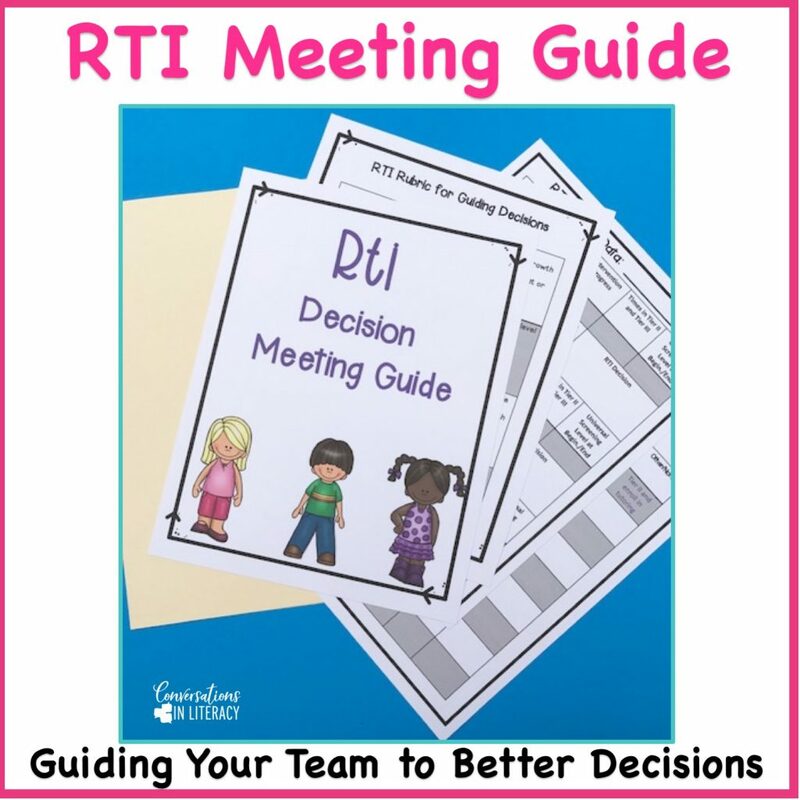 It’s time for the RTI meeting so your team can make some informed decisions. You’ve gone through the whole process of universal screenings, placing students in tiers and progress monitoring. Now you need to make decisions based on the data that was collected. But where do you start? It is helpful if you have a guide to get you started as the decisions your team will be making are really important for your students! 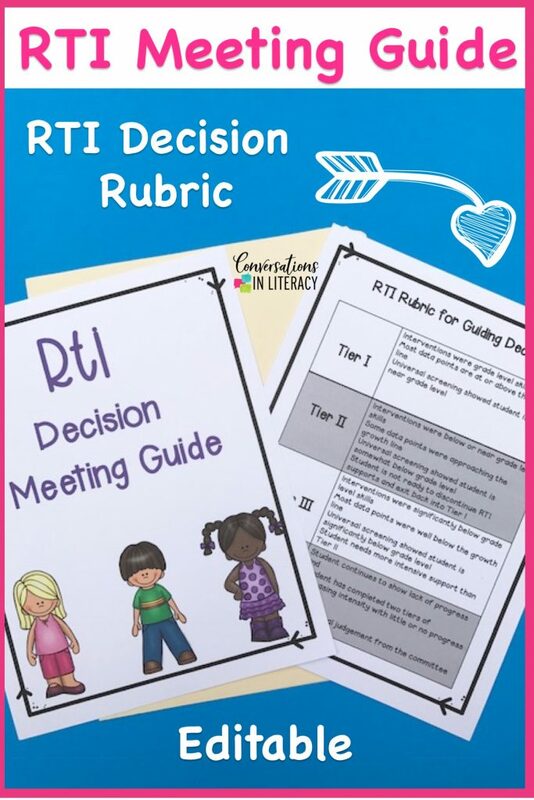 This is our 4th post in our series on RTI for Reading. You can catch up here on The How and Why of RTI, Understanding Universal Screenings, and the Power of Progress Monitoring. These team members as a committee will meet with classroom teachers about their students in tiers II and III. 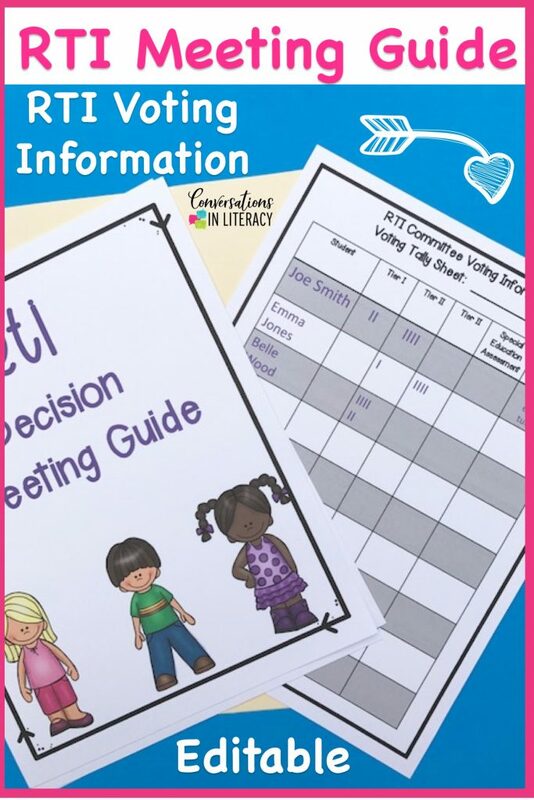 The head of the committee or your RTI Coordinator would gather the data on each student in tiers II and III for the meeting. You need data like which tier the student is in, universal screening score before and after they completed RTI, data about weekly progress monitoring, etc… so the committee has a good overall snapshot of information about the students. Then as each individual student is discussed, a rubric for guiding your decisions is very helpful. The rubric should guide the committee’s decisions so emotions do not take over. Teachers get very emotional at times over students and wanting to help them because they care so much about them! At the same time, the rubric should guide and not completely overrule as sometimes the data just doesn’t show what we know the child needs. There must be a guide to follow but also be able to use common sense. After all the data is presented, the committee and the classroom teacher discusses the data and how the student has progressed in the classroom with having completed the interventions. Each committee member gets a voice and votes for the student to continue in the same tier, go up a tier level, discontinue to tier I or even be recommended for assessing by the special education team. It is a long process with many difficult decisions being made through out the day. But at the end of the day, if you are using data and have an organized system to guide your decision making, your decisions will be more informed and better for students! 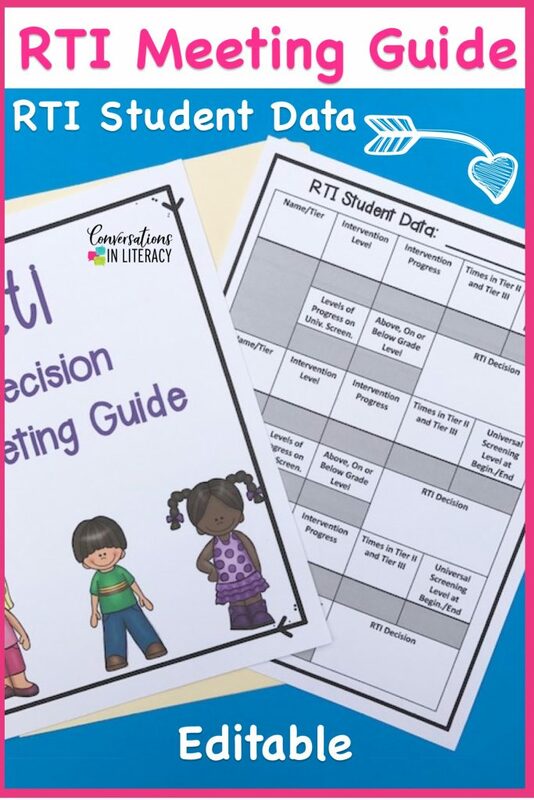 This RTI Decision Meeting Guide is editable for you to plug in your student’s information. 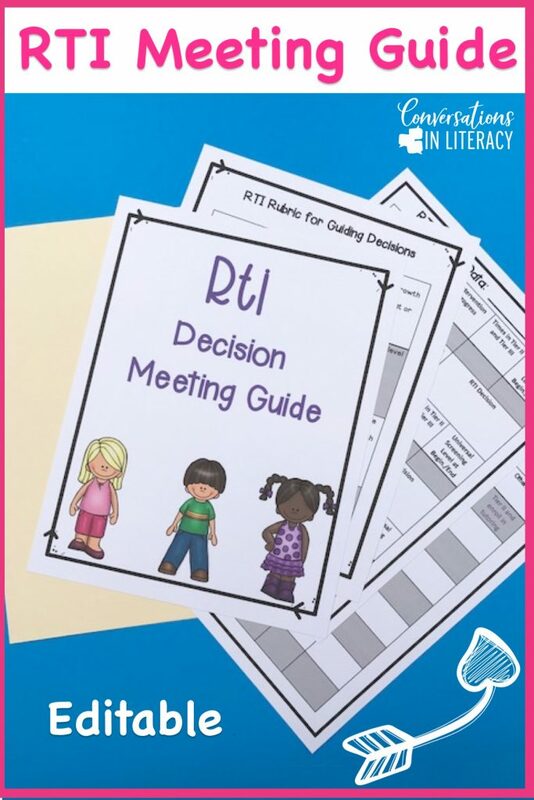 Find this RTI Decision Meeting Guide right here. 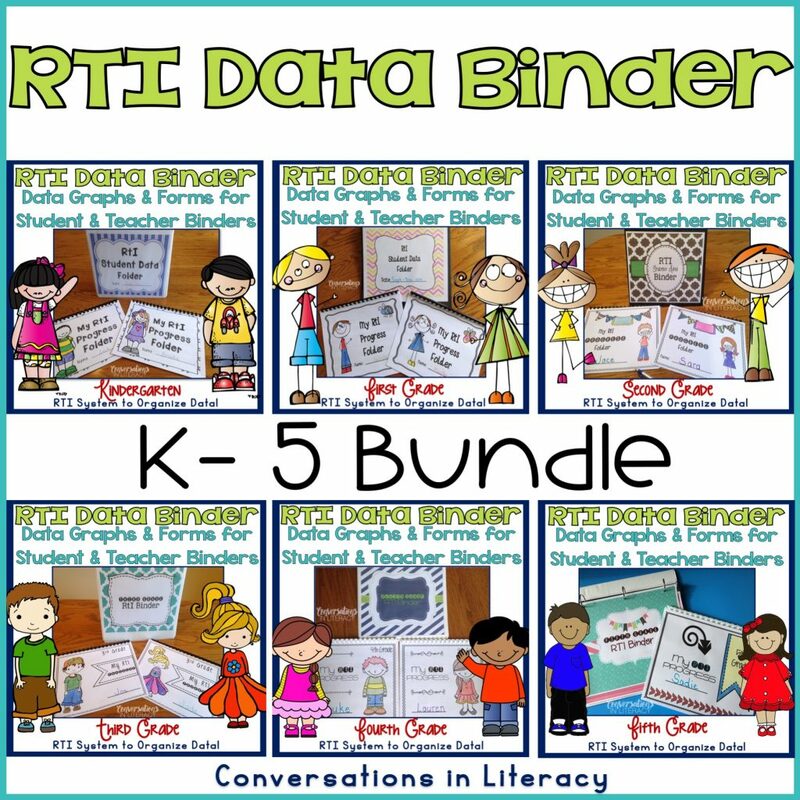 To document RTI Reading intervention progress, our K-5 Data Binders are a huge help for organizing RTI and in saving you time! Students also get to chart their progress, which helps build ownership and intrinsic motivation for learning. Each binder can be purchased separately by grade level or as a set. You can see the bundle here.